Harvey L. Poppel, chairman of the Palm Beach Civic Association’s Long-Range Planning Committee, presented an update to the Town Council on Tuesday. The Civic Association’s Long-Range Planning Committee was formed 18 months ago and has since spawned several subcommittees. One of those is the Financial Strategy Subcommittee. Mr. Poppel spoke about the latest findings from that subcommittee. 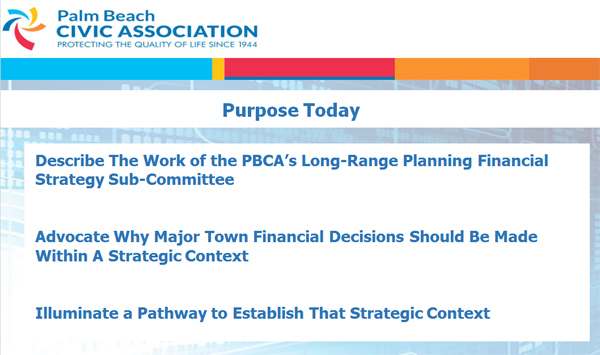 The work of the committee to date includes: identifying relevant trends impacting Palm Beach over the next 10-20 years; performing a forward-looking analysis of the town’s strengths, weaknesses, opportunities, and threats (SWOT); collecting, reviewing, and analyzing town financial, property and tax records/reports; reviewing recent history of more significant town financial decisions; screening best practices employed in other similar communities; and developing this report for the Town Council. Having a financial strategy will avoid decisions which may appear optimal short-term but are sub-optimal in the long-term, Mr. Poppel said. It also minimizes the risk of bad financial decisions and avoids being blindsided without enough time or resources to make optimal decisions. 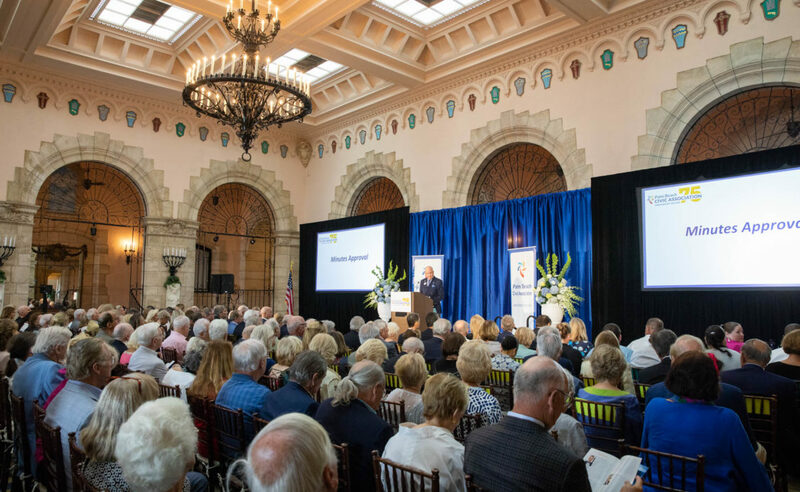 It helps in taking a proactive rather than reactive stance, facilitates community engagement, and ensures Palm Beach’s long-range financial integrity. Mr. Poppel pointed to threats that could impact the town’s stable financial condition within the next 10 to 20 years. Those threats include compounding U.S. debt, rise of corporate/personal debt, severe recessions, European Union dissolution, China-India meltdowns, new wars, sea-level rise, and devastating hurricanes. Local challenges include changing the pension plan, infrastructure enhancement/replacement, new infrastructure, significant new safety/health requirements, and business community sustainability. Those factors combined can affect the financial health of the town down the road, Mr. Poppel said. The subcommittee has begun putting together a “Vision 2035” statement outlining what qualities will keep residents enjoying an exceptional quality of life. Among them: living in a safe, sustainable town recognized for its stunning architecture; enjoying social & recreational experiences; having a thriving business community; and benefiting from an effective town government. Yet, despite this aspiration, Palm Beach will have to improve efficiency and expand and improve services to reach these goals, he said. Mr. Poppel recommends that the town adopt a strategic overlay for town fiscal planning. The most important aspect of the plan would be to hire a strategic planning officer “who has the ability to look at the broader picture,” he said. It would cost each taxpayer less than 10 cents a day to have someone in that position, Mr. Poppel said. “Each department needs to be thinking about this type of analysis and think in the longer term and of the ‘what if’s,’” he said. In addition, a study needs to be done to determine the true size of the Palm Beach population, including both residents and seasonal visitors, he said. Mr. Poppel recommended that the town consider establishing a dedicated strategic planning function within town government as well as transitioning the work of the Civic Association’s Sub-Committee to a new “Financial Strategy Forum” with broader volunteer representation from other stakeholders, including the business and institutional communities. Town Council President Danielle Moore thanked Mr. Poppel and the Civic Association for the presentation. 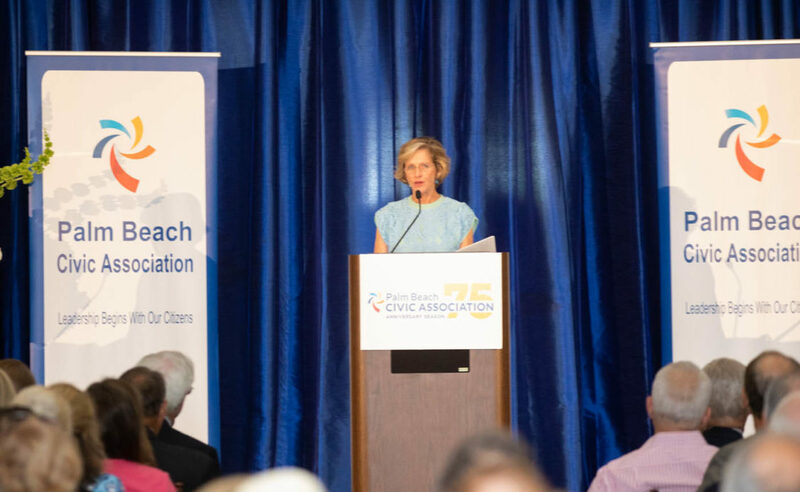 For more information about the Palm Beach Civic Association, visit palmbeachcivic.org or call (561) 655-0820.